“Marcel is a German expat living in Ireland and working for an online company with a colourful logo. He loves doing stuff with words, and did not go to school to learn this. He likes Heavy Metal and trains and dislikes many other things. He is so old he still buys CD’s, but has not yet caught up with the idea of becoming an adult. Find Marcel on his personal blog King of Pain (in German and English) or at Dublin Community Blog where he is a contributor. 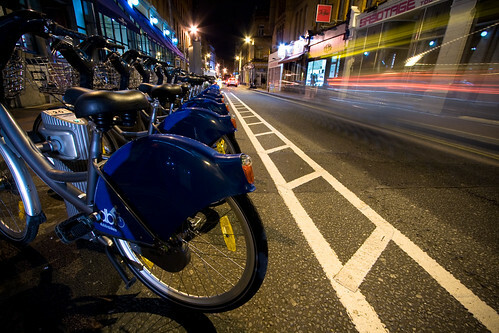 Ireland’s capital Dublin has recently joined the list of European cities to have its own bike sharing scheme, including Seville, Brussels, Nice, Paris, Cologne and many more. There are 40 bicycle stations throughout the city. These are located in close proximity to each other, every station has a minimum of 15 stands and so there are a total of 450 bikes meaning that access to bikes is relatively easy – and it’s also quite easy to get around town. There are no reports about stolen or vandalized bikes yet, and I’ve seen many people using the bikes througout the city. You can find all necessary information on the operator’s website. I think that theses bike rental initiatives are a really good thing, especially as most bikes are free to use (for a limited time though – the first 30 minutes are free in Dublin) and it’s a healthy way to discover a city. Depending on the local traffic that is – and it’s less exhausting to bike around in flat Dublin in October than in hilly Nice in the August heat.